With Valentines Day just around the corner I thought I’d share my seasonal decorations. I kept things pretty simple, using what I already had, including multiple items I use as props for my photography mini sessions – as always, striving for items in my life to be efficient and pull double duty. 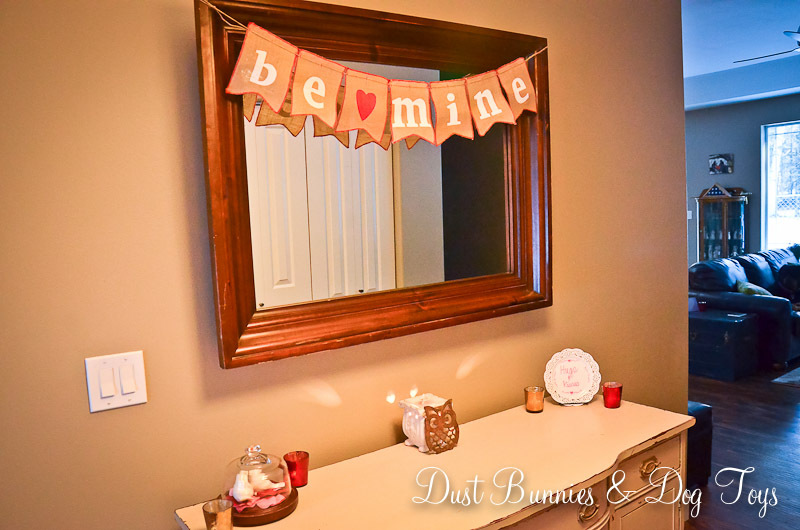 In the entry way I dressed up the large mirror with a burlap banner and added some pink, red and gold items to the entry table. 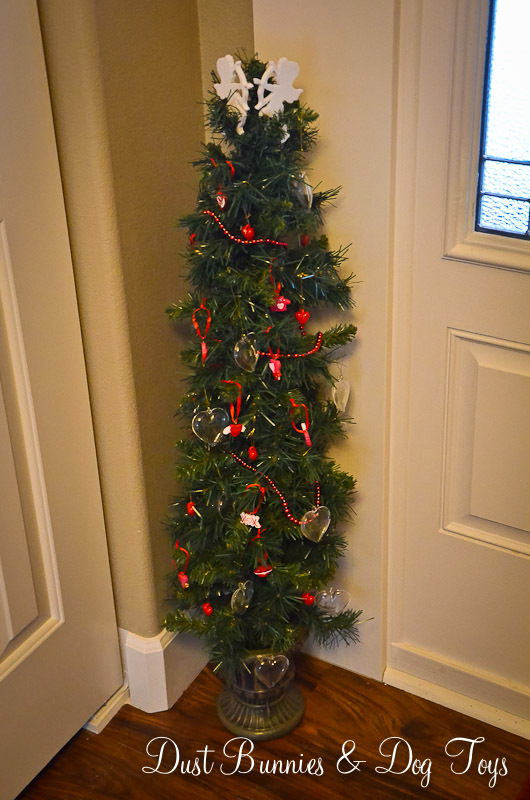 And next to the front door is my little holiday tree decked out with both red and clear glass hearts, Valentines themed ornaments and topped with cupids. 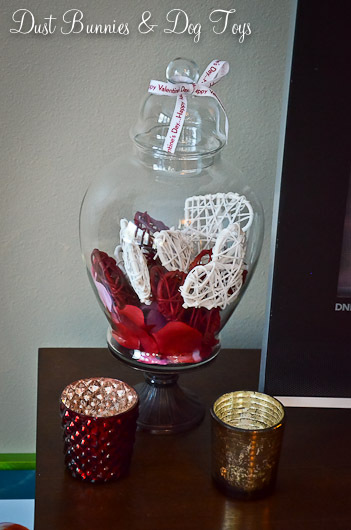 The TV stand got a little attention with flowers and hearts in an apothecary jar, paired with votives. 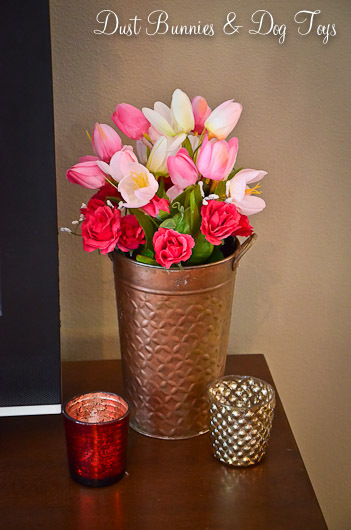 I also used a cute little heart cut out votive holder I found at a thrift store last year on the side table with some pretty purple and pink faux tulips in a mason jar. Unfortunately, during Stoli’s early days with us he decided that was his primary target of destruction, so the tulips are no more. I’ve since bought some cheap grocery store live flowers, which have lasted pretty well and still compliment the little votive. Somehow I didn’t take a picture of that, so maybe I’ll post one on Facebook later. 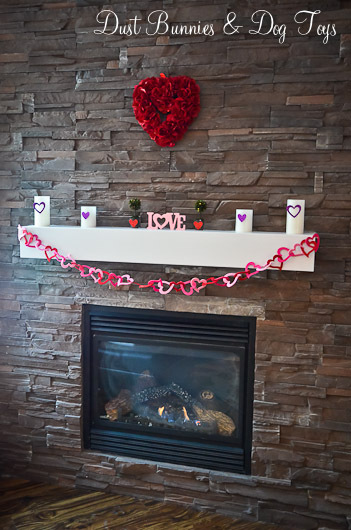 The mantel was the perfect spot for a heart garland and some pillar candles. I normally put the heart wreath on the door but I like it here better. The dining room got the left overs. 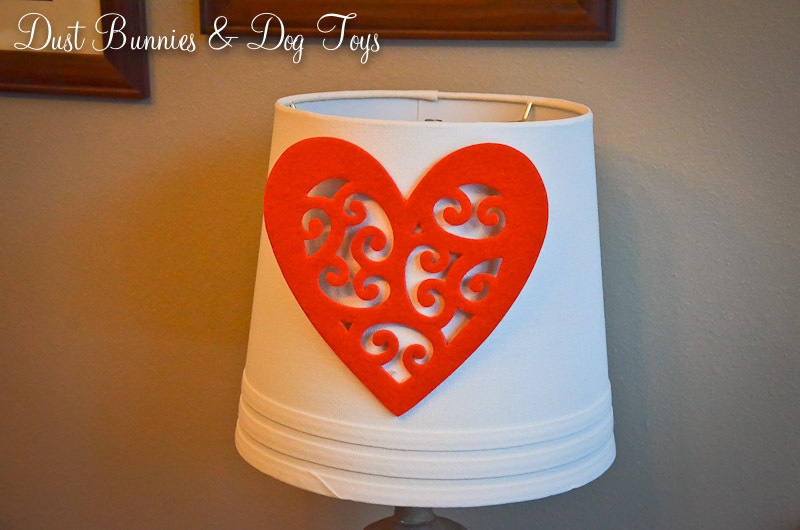 Some new felt filigree hearts on the lamps, and a rose petal filled basket that holds an XOXO piece I found in the dollar section at Target. Same as the LOVE piece on the mantel. I really love how the heart looks on the lamp when it’s all lit up at night. And it’s pretty during the day too. So that’s it. Sweet and simple, just like I said. 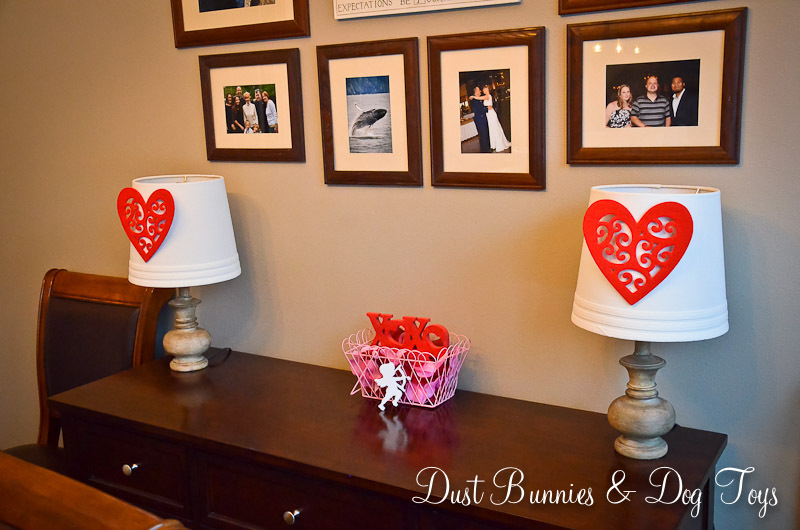 What did you do for Valentines Day decor? 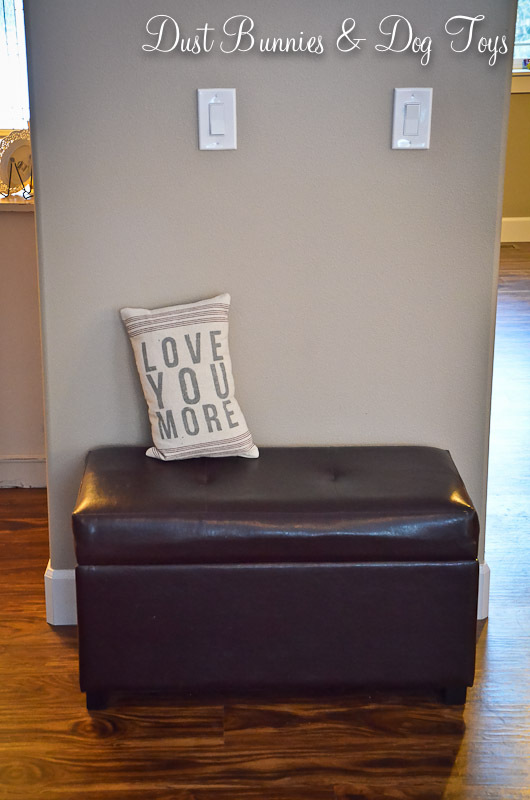 Did you DIY something special, or work some bargain finds into a great display? I want to hear about it!